The first Essex was built in 1918 in the old Studebaker factory on Franklin Avenue in Detroit. 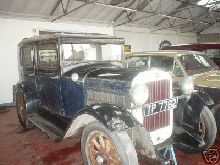 The Essex make was part of the 'Hudson Motor Car Company'. In 1919 on the Cincinnati circuit, an Essex completed a distance of no less than 4,859 kilometres in fifty hours. In the '20s, closed cars were something of a rarity. When in 1922 Essex offered such a model for only an extra $300, production figures soared. In 1929, the Hudson-Essex combination held third place in the list of American automobile producers. That year, a record number of 300,962 cars were sold. Of these Essex accounted for no less than 227,653. However, Chevrolet was now also in a position to offer a cheap six-cylinder, and although Essex still advertised with the slogan 'King of the Sixes' the company lost more and more ground. In 1933, the make disappeared from the market, to be replaced by the Terraplane.